1. Infuse it with flavor and color – Add a few slices of orange, apple, lime, or other fruits and veggies to flavor the water naturally. Use a cup with a clear lid to showcase the fruits (we eat and drink with our eyes first!). 2. Keep it cool – Some kids prefer iced water. Make it extra cool with fun ice cube shapes or frozen fruits. 3. Make it easy – If you’ve ever tested one of your kid’s no-spill sippy cups then you know they can be a struggle to drink from. Toddlers only have about half an adults’ suction power, so if it’s hard for you to drink from the cup then it’s a good bet your kids are struggling too. 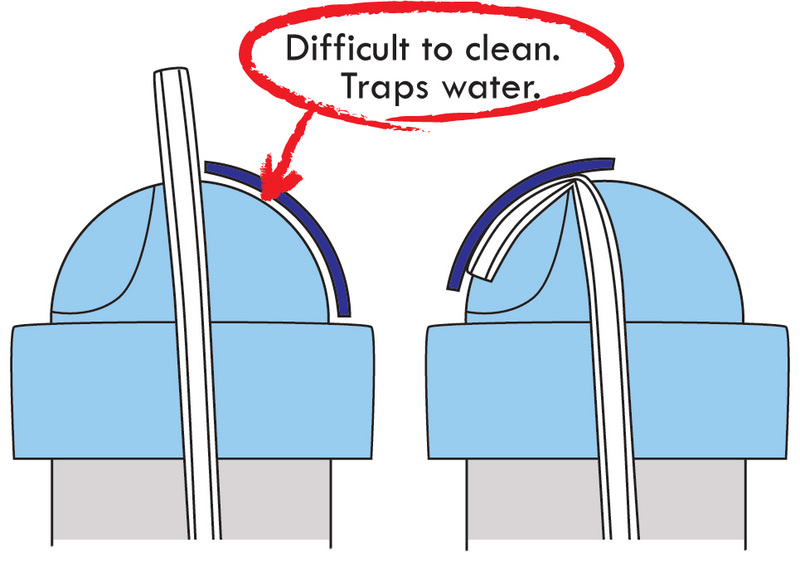 Make it easy by using either open cups or valve-free straw cups. Make water accessible by keeping cups filled throughout the day, and leave a cup filled with water on a nightstand for nighttime and morning thirst. 4. 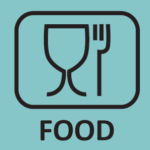 Take it easy – The dislike of a food or drink can often be overcome by repeating tastings (5 to 10 times over 2 weeks). But too much praise or nagging can often be counterproductive. Even little kids want to feel like they’re making their own decisions. 5. Be a role model – Children often copy their parents’ behavior, so while you’re filling up their cups, be sure to top off your own glass of water too. 6. Make it fun! –Serve water in cups with cute and colorful characters, and use fun interactive straws. Fun and special cups work very well with toddlers and preschoolers. 7. Chew on it – About one-quarter of our total water intake comes from foods. So for extra hydration, focus on foods that contain lots of water such as soups or fruits & veggies (cherry tomatoes, lettuce, cucumber, watermelon, oranges, grapes, peaches, and strawberries). 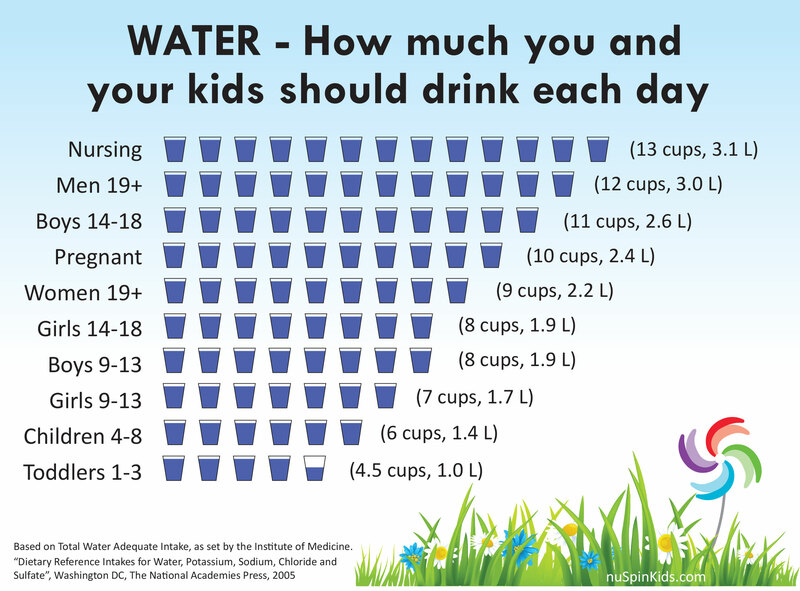 Learn about how much water you and your kids should drink each day. 1. Dr. William Sears. Ask Dr. Sears: Getting Kids Into the H2O Habit. Retrieved 7/12/2016. 2. Fluid Facts for Kids. Retrieved 7/12/2016. Some of the main qualities to consider when selecting the materials used in your sippy cup include food and fall safety, appeal, easy cleaning, and durability. 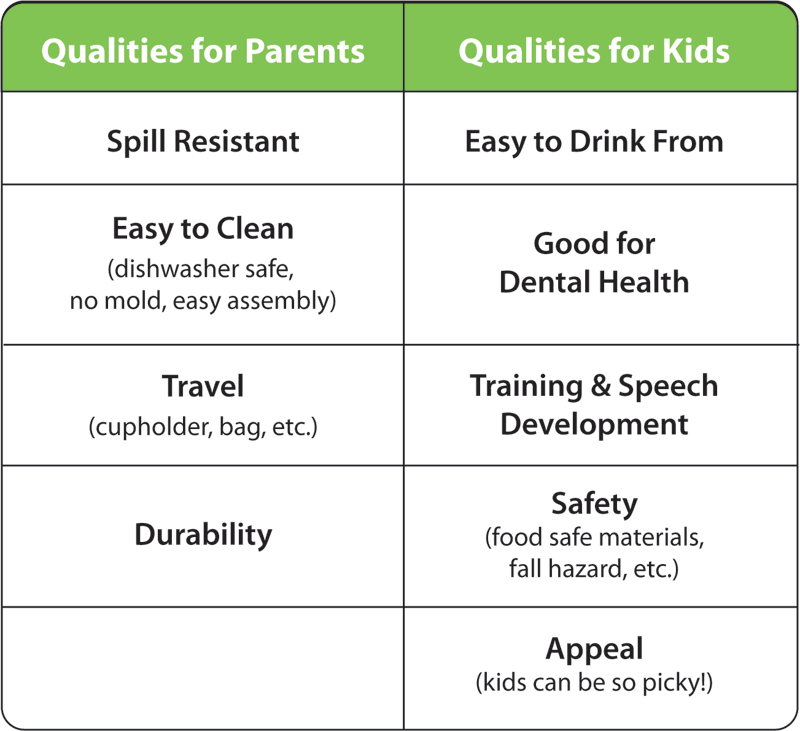 Silicone, polypropylene, stainless steel, and glass are safer materials recommended for kids. Polypropylene with embedded graphics is good overall. Plain stainless steel offers many excellent properties, but it poses a greater fall hazard, and isn’t very appealing to kids. Painted stainless is more appealing, but toddlers can teethe on or eat flaking paint. Glass has many excellent properties, but it poses a greater fall hazard, and shards can be ingested or cause lacerations. 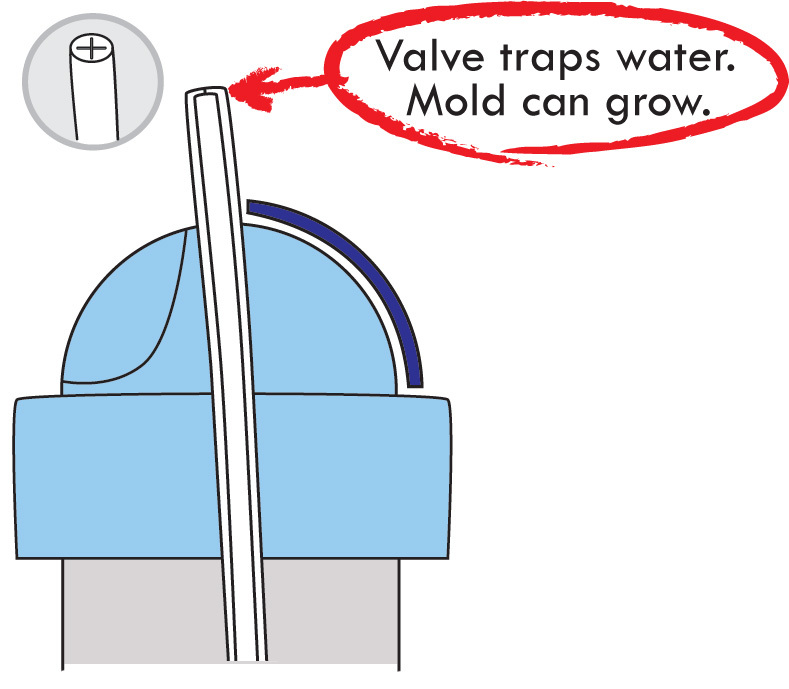 Silicone is the superior rubber material for straws, spouts, and valves. 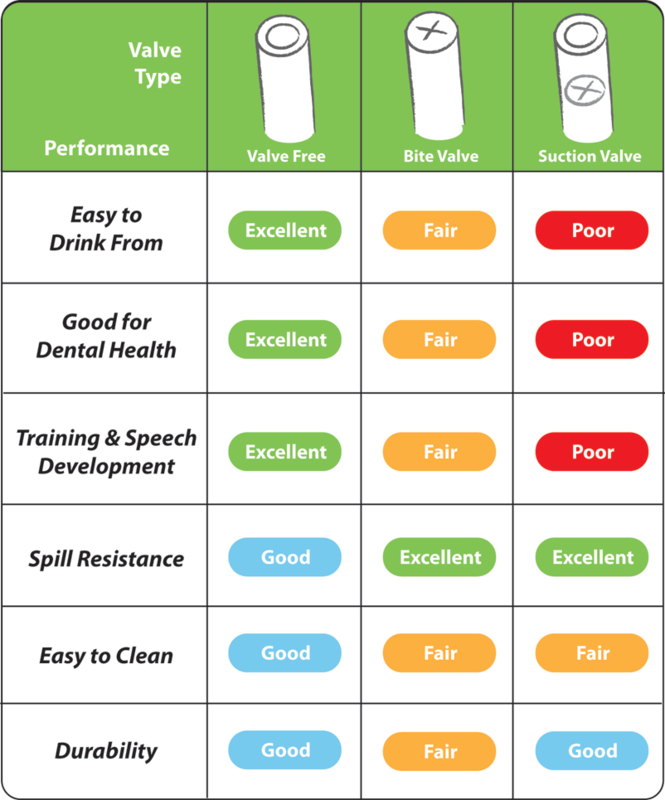 This is part 2 of a 2 part sippy cup selection guide (read part 1 here). 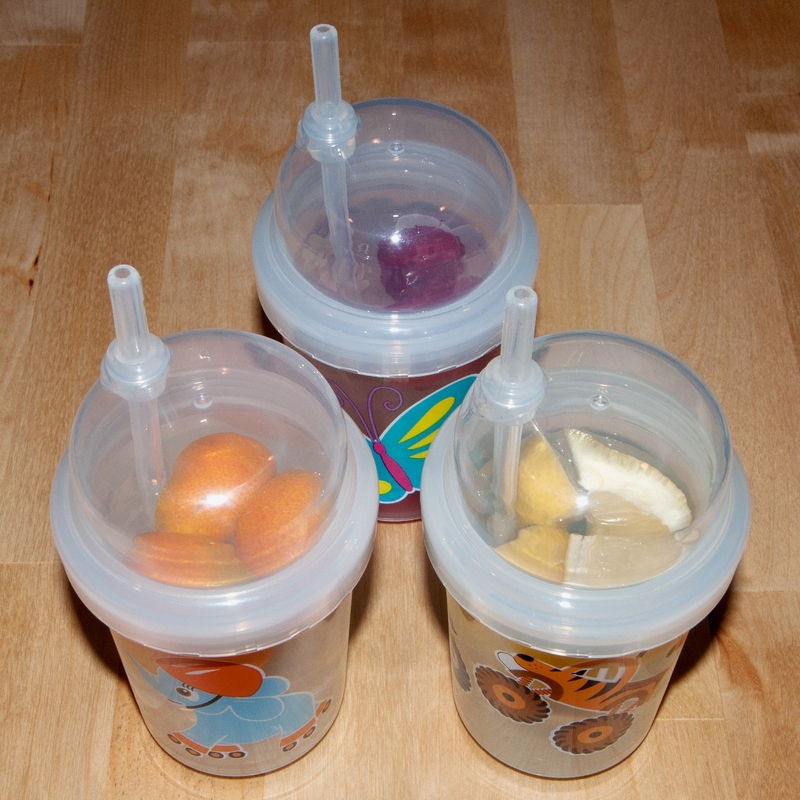 In this part, we’ll review sippy cup material options (plastic, steel, glass, etc.) so you can choose what’s best for your family. 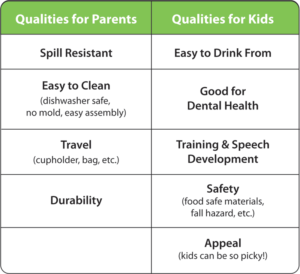 Listed below are many of the qualities that must all be balanced in a good sippy cup. Parents don’t and probably won’t ever agree on what makes the “best” sippy cup… just check the passionate and contradictory love/hate reviews for your current favorite! This guide emphasizes the safest choice wherever practical, but shows all the performance trade-offs so you can decide what’s best for your particular needs. 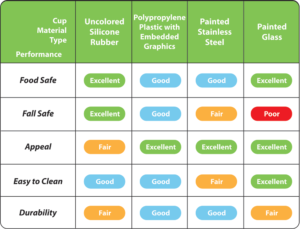 This section compares the safest materials currently in use for sippy cups: 1) uncolored silicone rubber, 2) polypropylene plastic with barrier over graphics, 3) painted stainless steel, and 4) painted borosilicate glass. Easy to Drink From – Transparent materials (silicone, polypropylene, and glass) have the advantage over stainless steel since parents can easily see when the cup is empty and refill it. Fall Safe – Two thousand children per year are given emergency treatment for injuries from a bottle, pacifier, or sippy cup, and the majority (86%) of those injuries are due to falls with the product.7 Most injuries are to the mouth, head, face, or neck. 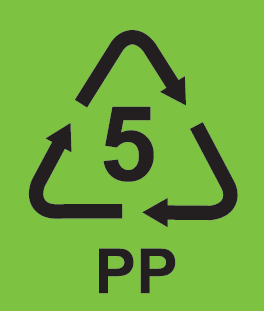 Silicone and polypropylene are more flexible than steel and glass, and should be less harmful to fall onto. Further, glass may chip or shatter, increasing the possibility of injury from lacerations or ingestion. Appeal – Ideally, your newer, safer cup will be appealing enough that your kids will happily trade in their old bottle or spouted sippy for it. Kids like cute and colorful products. So although clear silicone rubber (no added dyes or pigments) may be safer than colored silicone, it is likely less appealing to kids. Likewise, although natural stainless steel is the safer option, it is much less appealing than painted steel. In contrast, clear polypropylene can be made very appealing by adding graphics, and still retain the safer status by encapsulating those graphics with a food safe barrier. Easy to Clean & Durability – Silicone is dishwasher safe and resistant to heat, cold, sunlight, and chemicals, but is sensitive to biting and tearing. 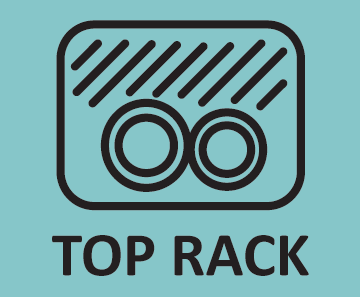 Polypropylene is generally top-rack dishwasher safe, fairly resistant to heat (e.g. 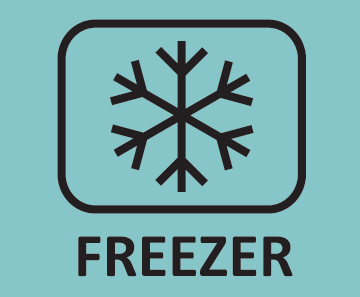 steam sterilizing is ok, but boiling is often not), fairly resistant to cold (more fragile when cold), more sensitive to sunlight (uv), and fairly resistant to chemicals. Natural stainless steel is very resistant to heat, cold, and sunlight, and has good chemical resistance (although it can be susceptible to acid and corrosion). 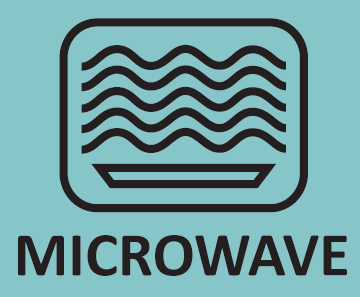 Painted stainless steel can be dishwasher safe (depending on paint), but will be more sensitive to sunlight and chemicals, and requires care not to chip or scratch the graphics. Glass is dishwasher safe, and is very resistant to heat, cold, sunlight, and chemicals. However, glass is the most brittle among these materials, so durability suffers when in the hands of a toddler. 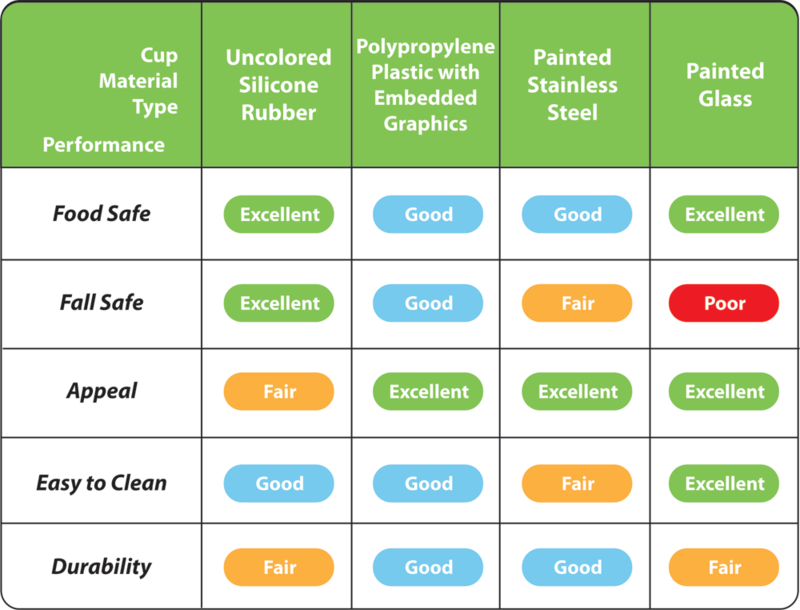 This section compares the safest rubber materials currently in use for straws, spouts, and valves: 1) uncolored silicone rubber, 2) uncolored thermoplastic olefins (TPE-o), and 3) uncolored natural rubber (latex). Food Safe – Silicone is the safer rubber material recommended for kids.10 Silicone rubber has no known health hazards for use in cookware.8 Natural rubber generally contains proteins that are allergenic and may develop sensitivity upon repeated exposure9, and may leach nitrosamines10 (a carcinogen). Colorants (dyes and pigments) can be added to modify the color of rubber, but they also modify the chemical makeup and food safety. Each colorant is different, some have regulated maximum concentrations set by the FDA for food contact. Covering each colorant individually is beyond the scope of this guide, but as a blanket statement, uncolored rubber is generally the more certain option. Easy to Clean & Durability – Silicone is dishwasher safe and resistant to heat, cold, sunlight, and chemicals (including acids and fats). 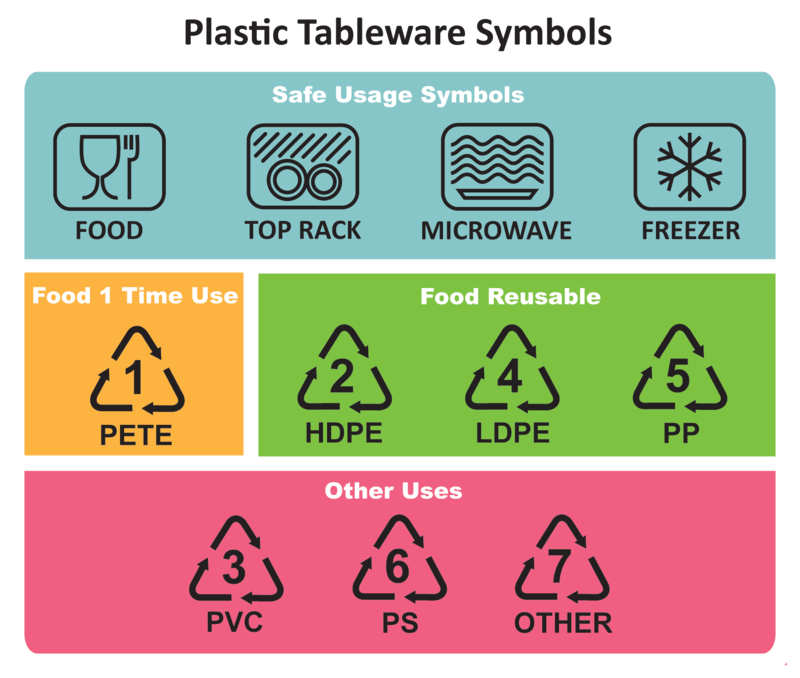 Silicone has a smoother surface than natural rubber, and so is less likely to be colonized with microorganisims.13 TPE-o can be dishwasher safe, but tends to degrade and stain more when exposed to heat, sunlight, and chemicals (sometimes becoming tacky). Natural rubber is not dishwasher safe and deteriorates faster than silicone when heated14, and is less resistant to sunlight and chemicals (such as fats from milk). All three rubber options are sensitive to biting and tearing, so have limited lifespans when in the hands (and teeth) of toddlers. 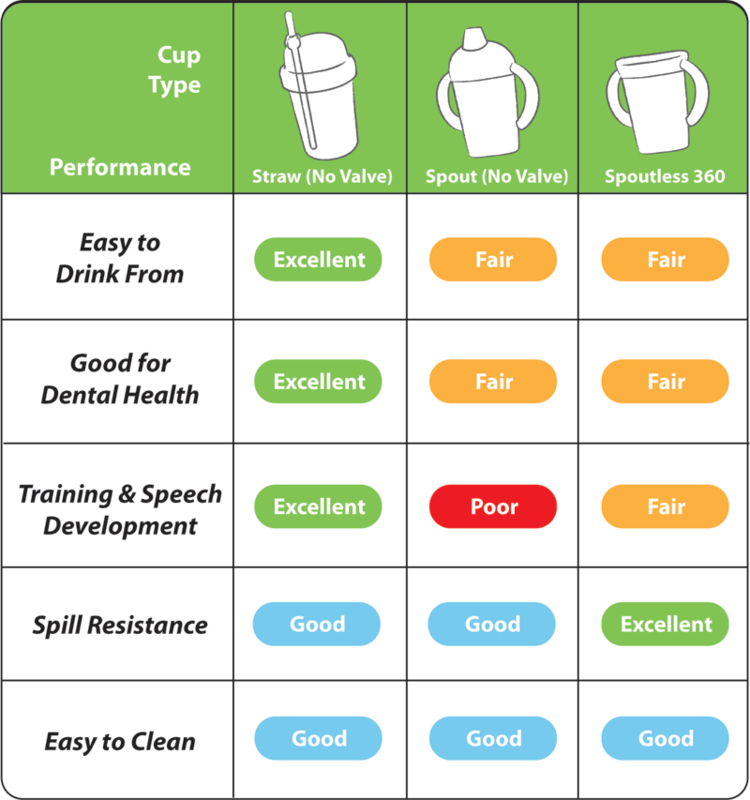 Best Sippy Cup Selection Guide – Part 1 of 2. Part 1 of this series compares the various types of sippy cups (straw vs spout, valve vs valve-free, etc. ).